If you control no monsters in your Main Monster Zones: Target 1 monster in your opponent’s GY; banish it, but if you have 3 or more Spells in your GY, you can Special Summon that monster to your field instead, but it cannot attack. Sky Striker Mecha – Shark Cannon is like a Monster Reborn and D.D. Crow rolled into one. No monster in your Main Monster Zone are the only requirements for this Quick-Play, so no tokens or stolen monsters. A good counter to your opponent targeting a monster in their grave, or attempting to activate a grave-based effect. You want the added effect of Special Summoning their monster though, and having 3 or more Spells in your grave in this archetype is easy. Sure, it can’t attack and it takes up your Main Monster Zone (both counterproductive), but you still get to activate the monsters effects, which doesn’t usually happen with cards that allow you to take a monster from your opponents grave. You won’t always be able to overpower your opponent with your Sky Striker Link Monsters, so you’ll need to Link Summon at some point, and this card can help you do that. Average card is average. Sky Srtiker Mecha – Shark Cannon is a Quickplay Spell Card that banishes a targeted monster from your opponent’s grave if you control no Main Zone monsters. Free and not once per turn effects are good. Bonus effect if you have 3 or more spells in your grave is to Special Summon the monster to your side but it can’t attack. You get to keep it for as long as you like which is cool, but it puts a monster in your Main Monster Zone. Widow Anchor does a more useful task, being offensive or defensive. This just extends combos, and there are better cards for that. Shark Cannon has a cool name, but only a side deck worthy option. Next up is another Sky Striker Quick-Play Spell, Sky Striker Mecha – Shark Cannon. 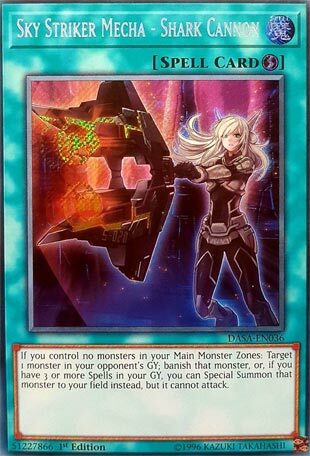 Just like most of the other Sky Striker Spells, you can only use this when you don’t have any monsters in your Main Monster Zones, which again isn’t that bad of a drawback if you have a monster in the Extra Monster Zone or use this first. When this card is activated, you target and banish a monster from the opponent’s GY, but if you have three or more Spells, you can Summon that monster instead, but it cannot attack. This is some ok disruption if your opponent is making GY plays. Banishing a card can be a pain for them, and summoning it can help you open up some more plays. Shark Cannon is solid, but Widow Anchor is better. Other decks already have Called by the Grave, but the pure Sky Striker deck could probably play one of this since it is solid and can be useful from time to time. Art: 3.5/5 That cannon looks like it is gonna hurt.